We are the leading occupational health program on the Gulf Coast with three clinics and medical staff solely dedicated to providing work-related healthcare. We offer a comprehensive 24-hour network treatment program to take care of employers' occupational and industrial medicine needs. Infirmary Occupational Health is the only local provider solely dedicated to occupational medicine and that offers a corporate wellness program. As a leading provider of healthcare, we believe that fostering a culture of health within our own organization, as well as our community, is not simply a solution to growing healthcare costs; it is our social responsibility. 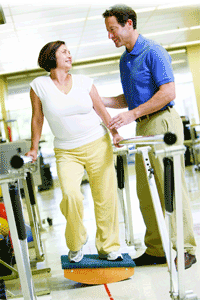 As part of the Infirmary Health Corporate Wellness Program, we develop customized programs for employers. Our clients also have access to iSYSTOC; a software program specifically created for employers. It provides access to any available employer-specific procedures that can be used when an employee visits the ER or other hospital department due to a work-related accident or screening requirement. Infirmary Occupational Health provides a wide range of rehabilitation and therapy services to help patients recover from accidents, illness or injuries. Our goal is to help employees get well and return to work as quickly as possible.